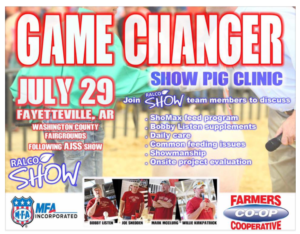 Learn from the best coaches in the show pig industry at the Game Changer Show Pig Clinic, in Fayetteville, on July 29th. Join the Ralco Show Team as they demonstrate the skills and strategies needed to rock your game in the show ring! Topic includes ShowMax Feed Program, Bobby Listen Supplements, daily care, common feeding issues, showmanship and on-site project evaluation. Ralco Show Team leading the clinic include Bobby Listen, Joe Snedden, Mark McClurg and Willie Kirkpatrick. Come learn from the best at the Game Changer Show Pig Clinic. Farmer Coop is proud to be a sponsor of the Game Changer Show Pig Clinic in 2017. Stop by your local Farmers Coop for show feed, supplements, supplies and most importantly, expert advice. Let Farmers Coop help you raise a winner this year! This entry was posted on Wednesday, July 12th, 2017 at 8:57 pm	and is filed under Events, News & Updates. You can follow any responses to this entry through the RSS 2.0 feed. Both comments and pings are currently closed.